The platform side awning of the main station building was now mostly complete, so we turned our attention back to the street side. This is the side that will be viewed by the public at exhibitions. The centre portion of the facade between the two bay windows we had made up as a 3D printed item. This includes the four columns and the three arched openings with the centre arch in-filled by a window. Most of these 3D printed items were sanded and prepped for painting and were given two coats of paint prior to installing them - cream/yellow for the corner quoins, window architraves, columns, and corbels. The rest was painted in brick red with some of the smaller flat areas higher up on the facade in white, all as per the prototype. The series of images below shows how we progressively installed each of these pre-painted components. The centre portion of the main station building which is the main entrance to the station for passengers through either of the two large arched openings. The two bay windows were prepared for installation by first painting all parts of them in the appropriate colours. Tichy windows were pre-painted in a maroon colour and then glued in place from the back of each bay window. Pieces of clear sheet styrene were painted black and then glued in place into the back of each bay window opening, with the black painted surface of the styrene facing inwards. This prevents the viewer from looking into an empty space and externally the reflections off the clear styrene surface give the viewer the appearance of glazing. The two bay windows have been painted, with windows and glazing installed, and then fixed onto the building facade. Other windows to the buildings front facade were installed in a similar manner to the windows in the two bays. Pre-painted 3D printed window architraves were glued in place over the brick sheeting. Tichy windows were painted and fixed in place from behind. Black painted styrene was installed behind each window, and in some cases buff coloured card was installed to represent internal blinds. A closer view of the centre portion of the main station building. The street side awning will be installed later, fixed at the gap seen immediately below the long white strip of styrene across the top of the facade. We needed to make the small roofs to the two bay windows. Firstly some templates were tried with card to get the angles and the roof pitch correct. Once we had trimmed the cardboard templates into the shapes and angles that we were happy with, we used the card templates to cut the individual pieces out of sheet styrene. The styrene pieces were fixed in place with MEK against each other, the brick wall, and the bay windows. The roofs will later be painted an appropriate pale grey roof colour. View of the street side of the main station building with most of the 3D printed items installed. 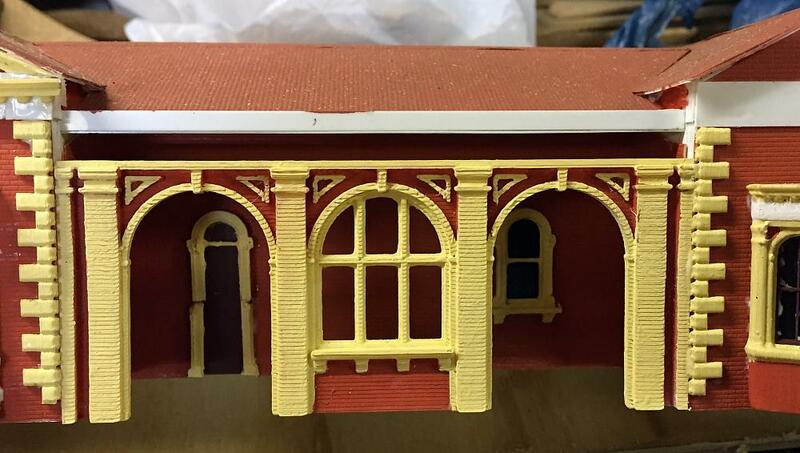 Along the base of the station building at Goulburn there is a thicker moulding part painted cream/yellow. We represented this by using strips of styrene, first painting them before gluing in place. The flat roofed parts of the building on either side of the main central portion of the building have walls that extend up past the decorative corbelled pieces. The parts of these walls above the corbels were painted cream/yellow as per the prototype. Roof mounted equipment and other details will need to be added later on. The street side awning is still to be built and installed, but we will wait and do this after the station building structure has been fixed into place on the module. The awning will join onto the central portion of the main building immediately above the 3D printed centre wall, and below the long white strip at the bottom edge of the roof.